As a full-year student you will live alongside other university students in the popular Studentenstadt (StuSta) Freimann, located next to the English Garden. Students are placed in different Häuser, and each floor has its own common area (GAP) where students come together to watch tv, share meals, have parties or just hang out and relax. Each student has his/her own (small but cozy) efficiency apartment that come with their own kitchen space (countertop burners, refrigerator, cupboards), private shower/WC, bed, desk, balcony, and internet. But life in StuSta involves more than just having a roof over your head. 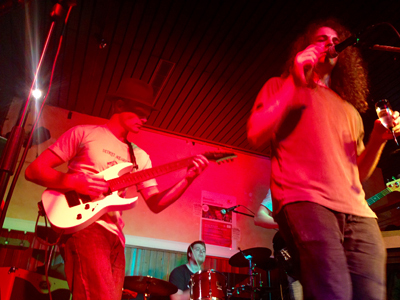 In addition to tutoring programs, extra-curricular workshops and courses, StuSta has its own cafes and Diskotheken, and is also where the largest student theater and music festival in Germany takes place: StuStaCulum! As a second semester JYM student you will be housed in one of the many other Studentenwerk dormitories located throughout the city, depending on availability. 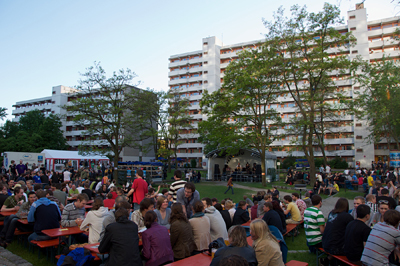 You typically may be housed in your own efficiency apartment in one of the highrises or bungalows of the student quarters known as Olympisches Dorf (Olydorf), which is very centrally located at the Olympia Zentrum. Another popular location is the Stiftsbogen (Stibo) dormitory in the south of Munich with modern WG-style rooms with shared common room and kitchen. Stibo is in close proximity to West Park and a convenient shopping center accessible by foot. JYM students are like students anywhere when it comes to food. After a while they'll find out where the best deals are for meals, on-the-go snacks and groceries. JYM rooms in the StuStadt have a small kitchen space; shopping tips will be given during Orientation. The Studentenwerk München manages 33 cafeterias and student bistros throughout the city, where you can get an entree for as little as 1 Euro! What's for lunch today? Visit the Mensa! Munich has a fantastic public transportation system which includes subways, trams, and buses (MVV maps). In fact, the subway stop at JYM (Königsplatz) resembles a museum! All university students (including JYM students) are required to purchase a highly subsidized "Semester Ticket." Details are provided in our Pre-Departure Bulletins. Munich is a very biker-friendly city, and most JYM students buy a second-hand bike while they are in Germany (as they've done for decades!). On the other hand, you can do it the old fashioned way and walk! Munich is one of those cities where you can walk forever and always find yourself surrounded by something beautiful. Give it a try! Name your favorite sport and chances are you can do it while on JYM. Soccer? Alpine Skiing? Hiking? How about blade-night or surfing the Eisbach? 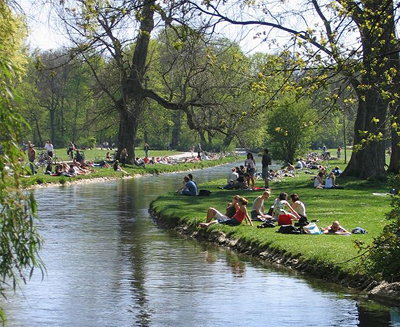 Whether you like to swim, ice-skate, ride horses or just ride around on a bike, you can do it in Munich. Because you're enrolled at LMU Munich, you can take sports and fitness courses through the Central University Sports (ZHS – Zentraler Hochschulsport München). But if you'd just rather do some extreme sitting in the English Garden and watch everyone else get tired, that's fine too! Imagine having a 900 acre city park (larger than Central Park!) right outside your apartment in StuSta! That won't happen often in your lifetime, but that's what you'll get on JYM. Whether you're chillin' or grillin' or just going for stroll, the English Garden - with its Chinesischer Turm and Seehaus - will quickly become one of your Lieblingsorte in Munich. 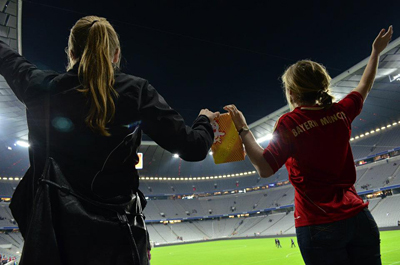 You will not be alone when you arrive in Munich! 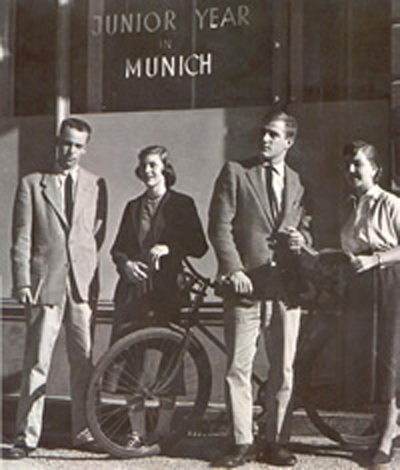 There are many student groups that are familiar with JYM and they look forward to welcoming you to Munich. JYM can connect you to activities that match your interests. Recent students have participated in university orchestras, cathedral choirs, worked on theatre set construction, taught at an English language camp for German-speaking children, and volunteered at local schools and charities. We can't make new friends for you, but we easily can point you in their direction. So, take the plunge – You'll be glad you did! Is JYM all work and no play? Hardly! JYM students are rumored to follow the tradition of the young 18th century poet and university student Gotthold Ephraim Lessing who recognized the value of setting aside his books now and then to go out among the people. Had Lessing been a JYM student, he would have arrived just in time for Oktoberfest! Where to go? We'll let you find that out on your own . 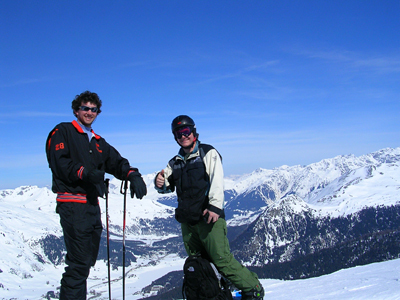 . .
Read how you can improve your German language abilities before you arrive in Munich!